Starting GPS Co-ordinates: N51 25' 70" W000 64' 20"
Finishing GPS Co-ordinates: N51 25' 70" W000 65' 60"
This is the 'wide part'! 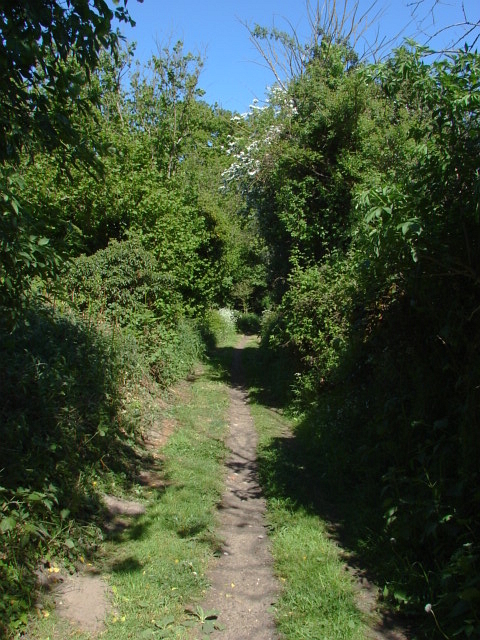 Sandy Lane is a very overgrown byway that runs between Wood Street and Willey Green in Surrey. When we drove it in 2009, due to the foliage, in places it is so narrow as to present a real challenge, and damage to the paintwork is absolutely unavoidable. It urgently needs to be pruned by the council. That said, as so few people have evidently been driving it the surface of the lane is in pretty good condition, its grassy surface being relatively dry and only lightly rutted. Also counting against it is the fact that it is pretty short. It also runs past a particularly un-picturesque caravan park on it's northern side. Beginning on Frog Grove Lane in Wood Street, the lane branches west opposite some houses and BT junction boxes. It winds its way to the south west, turns gently to the north west and passes with very little room for manoeuvre indeed between some horrible fencing around the caravan park on the northern side and the wild undergrowth on the southern side before turning northwards and ending abruptly on the A323 in Willey Green. When driving this lane from it's western end it really is very poorly signposted indeed (if at all), so take care to take the correct route (the trail biker in the video below drives it from the western end so follow his lead). As you can tell, there is little to recommend this lane and it really is not worth driving in it's present state is only included for completeness until the council cut it back.